NEW: Version 6.4 is out! 16/04/10. *See note below for Running Diablo II under Windows 7 properly! Note: This version requires an email to register for free, if you haven't already - full details when you start it up if applicable! Note: You do not need to check the box "run as admin" under compatibility for the shortcut any more! Download the .exe file to your desktop and run it. This extracts files to a new folder on your desktop. Go into this and run Setup.exe! before you can install any updated versions. This will not delete your backup folders! All files are guaranteed virus and trojan free. And Diablo II Patch v1.13 Out March 23rd 2010! 1/. Bugfix - Application now only allows one instance of itself to run at a time. Internal framework and layout changes. 1/. BugFix - Major bug fixed that was introduced in v6.2 - caused by program trying to save a 'default value' in registry for the launch mode. 2/. BugFix - Settings menu is now disabled for non-registered users. 3/. BugFix - The Current Working Directory is now changed to the Diablo II program location before control is passed to Diablo II through the launch button. 4/. New Feature - Added support for detecting the new Teamspeak v3.0 client. Previously only v2.0 was detected. 2/. Changed wording of modes to be more descriptive. 3/. Added ability of Character Manager to save the selected mode for the next time it is started up. Fixed two major bugs (and one minor) that slipped through in v6.0... Apologies for this. 1/. Renaming a character resulted in deletion of character in question! Now Fixed. 2/. Copying a character crashed the program. Now Fixed. 3/. Deleting a character no longer shows a second copy of it in the list of current characters. 1/. Added a new settings menu - with option to launch Diablo II in windowed mode! update from Microsoft if you are still running an older version. There is now only one setup file. 2/. Improved compatibility for Windows 7. 4/. Updated all links in the program to current tested URL's. 5/. Added full support for exporting, importing and viewing characters stored on USB Memory Sticks - mainly as hardly anyone uses floppy disks anymore in 2010!! 6/. Improved text in menu's. Corrupt Colours? Game Taking Ages To Start Up? Not Running At All? Crashing? Read Below!!! 1/. Run Windows Update - a recent compatibility update provided support for Diablo II under Windows 7. 2/. Patch to latest version of Diablo II - visit Blizzard's website for support on this v1.13 by the way! 3/. You MUST Run Diablo II in Compatibility mode for *Windows XP SP 2* (Running in SP1 or 3 will cause error messages during gameplay) - This is on the shortcut. 4/. Run the Shortcut as an Administrator. 5/. While you're there, check the box that says *Disable desktop composition*. This will allow Diablo II's 3D effects to render correctly. On modern high resolution monitors, Diablo II can show its age and look very stretched! This website has changed location - the new version points to this website address now. area to change this image at any time to the next in series. New "Start Teamspeak" Button, with code to detect the program from the registry. Created a proper Windows Help File for the program - to replace the old text-only version. The program is now "feature complete". Most of the things I wanted it to do are now done! There will probably be no more updates for a while - apart from minor bug-fixes. This program allows you to backup and restore your offline Diablo II player characters. It creates a folder named 'Backup' that holds a copy of your 'save' folder. second safety copy in 'Backup_Safety', that it can use in emergency situations! All these folders are stored within your main Diablo II installation folder. up and restoring my game characters in Diablo II. Also, there is nothing worse than losing your game characters due to something like a virus or hard disk failure! floppy disk import, export and view routines. and delete routines in the file menu. You can now also import a character from any folder on your computer into your current characters. This program needs the Microsoft .Net Framework v1.1 to be installed. You can download this from Windows Update, if it is not already on your machine. This program creates a shortcut on your desktop. Use this to run Diablo II! This program is written for Windows 2000/XP and above. Fully compatible with Diablo II v1.10 and Windows XP Service Pack 2. “Diablo II Character Manager” was not designed for cheating. It is also not designed for editing your character stats, gold etc. There are other programs out there that do this should this be what you are after. I wrote this program purely for backing up my characters – handy should a disaster strike – or just for peace of mind. It is also useful for transferring your Diablo II characters to another computer, using a floppy disk. This program is compatible with Diablo II, V1.10 and below - both regular and expansion versions! It uses Microsoft.Net v1.1 and is written for Windows XP, although it will run on Windows 98 and Windows 2000. This new version has been tested on Windows XP Service Pack 2 and runs fine. This program first detects if you have Diablo II installed and if so, in which location on your hard drive it is stored. Inside that folder, Diablo II keeps a subfolder called "save". Inside there, your characters are stored. Diablo II uses different types of files to store all the character information. These files have a security number in them so are not easily "tampered" with. If you try this manually, Diablo II will come up with an "Invalid Character File" error and cancel the game. Not every character you play with will use or have all the files above - but they will all have a Player.D2s file! All you need to know about Diablo II Character Manager is that it manages ALL these files for you, invisibly! it ALWAYS looks for the other files for that character (if they exist) and makes sure they always get updated as well! quickly giving you access to the folder where Diablo II is installed on your computer. in the green box and your "Backup" characters in the red box. This also shows the characters Class, Level and Last Modified date and time. modify a character by "renaming" or "restoring" it for example. if it existed is deleted before the new "Backup" is created. It also creates a second emergency copy in another folder, called "Backup_Safety". where your main game characters are stored - the "save" folder. This overwrites any existing game characters! provided you have your game play cd inserted in one of your drives. “Start Teamspeak” will only be enabled if this program is installed on your computer. If you don’t know what this is – look at the Reference Menu – Get Teamspeak Software option! Hovering with the mouse over the main window at various points will also show floating "tool-tips" for various things. left click or right click anywhere blank in the main window area to change this image at any time to the next in series. This does exactly the same as the main Backup button on the main window, described above. This does exactly the same as the main Restore button on the main window, described above. This restores the "save" folder from the emergency folder "Backup_Safety". by some unknown reason. New "Backup" and "Backup_Safety" folders are created afterwards. This allows you to "Clone" one of your existing characters. The copy has all the stats and equipment your original had. this "tampering" damage so your new character is "legal" and works with no problems. Same as above regarding the details, but this time it allows you to rename an existing game character. This deletes a character completely so use with caution! This exports all your "save" folder to a floppy disk. It checks the disk has enough space first. 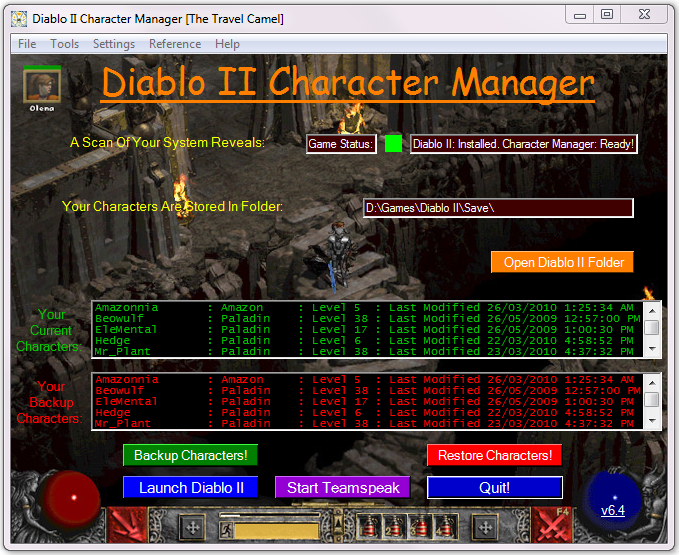 The characters are stored in a folder called "Diablo II Character Manager Export"
on the floppy. This is deleted before the new backup is made, if it already existed! Use this to create a safe backup - away from your computer - or to give your character(s) to someone else. This does the opposite of the above - replacing your current game characters with the copy on the floppy disk. This will show a report on the characters stored on the floppy - just like on the main window. You would normally use this first, before importing. This allows you to import a single .ds2 file from Any folder location on your computer or floppy disk. Useful if someone has sent you a character by email etc. and you want to import it. This launches a webpage showing the current Battle.Net server status reports. Handy to check before you play a game to see if there is any maintenance of the servers due. This takes you to Blizzard's wallpaper download internet page. A hand picked list of the best Diablo II related websites. Some have pop-ups. in real time with other players – rather having to type all the time! It works great with Diablo II as well as with most other games. Once installed Diablo II Character Manager will pick it up and enable the Start button. Use the Speex 16.3 Kbit Codec (or above) and bind the Push To Talk Button to "RIGHT ALT". Set the output volume one notch above normal. update to the latest version as things are always being fixed/added. This just displays this file, as you probably already noticed! Displays contact email address, credits and program version. v4.0 - Released: 18th October, 2004. This program is free to all Diablo II players! All graphics and music are (C)Blizzard and are not used with permission. it can be seen as a free advert for Diablo II!